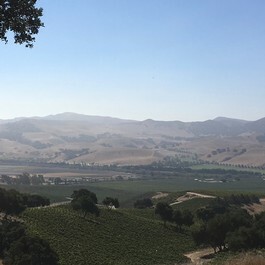 One morning I was traversing the route between breakfast at Bob's Well Bread Bakery in Los Alamos and the Winery's Crush-pad in Orcutt, when my gaze fell upon a vineyard climbing up the top of the coastal mountains. Driving down the 135 between bites of ham and cheese croissant washed down with black coffee, I pulled off the road. 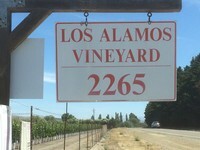 Where I landed was near a sign that was white with red font: Los Alamos Vineyard. 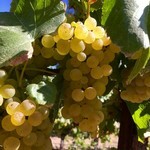 Beginning at the road side the Chardonnay was on the flat ground in a bilateral cordon trellis. Rows of vines extended completely along the flat and inclined slowly up the hillside to very near the acme. The vines wound their way up as far as I could see. This was a very large Vineyard. I was intrigued and decided to explore. It was there that I first met Tavo Acosta, the Vineyard manager. This was an extremely productive vineyard that supplied lots measured in hundreds of tons to multiple famous winery labels. I told him I was looking for something unique and small; not exactly what I was looking at on the main floor of the property. I figured I was asking for something he probably was not normally sought. And, I caught his attention. He said that his place can supply quality fruit in large amounts; and that is how it was planted. However, he knew some sweet spots that were much more with huge potential and a proven track record. Several small lots had already been developed for high end Chardonnay projects by winemakers expressing finesse and Terroir. The top, he says, check out the blocks at the very top. My first Harvest in Los Alamos was in block 18. I liked this block because it had a history of producing high-quality Chardonnay. There was right next to a very fine winemaker and chef that made Chardonnay that I appreciated. I choose a spot on a steep slope producting fantastic wine in 2015. However, in 2016 I wanted to push the envelope and see if I could find something unique. Hence, I sought something a little different. After discussing my thoughts with Tavo, he said that he thought he had something for me. It was different in the sense that it was too small to be a part of any of his other main projects. 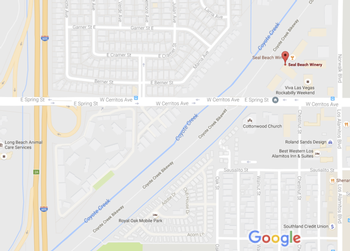 It was only 1.74 acres. It was interesting in that it was isolated: a micro-Terroir. It was Clone 4 on the Freedom Rootstock like Block 18 but the soil, topography and row direction were different. Most importantly, it was completely isolated and would be my own slice of the vineyard; my own block of Chardonnay. Tavo drove us up to the vineyard top in his 4 x 4 as there was no way we were going to make it without it. It was a bit dicey but we finally reached the top. As we approached the Vineyard there were two things about the top: the view and an unusual tree. From where we stopped, you could look out and could see the entire valley. The 135 now looked like a little tiny stream and cars were specks. 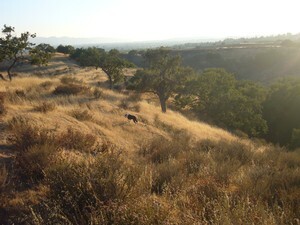 It was am amazing expanse of the entire vallley. Second, there was this tree. It sat at the entrance of the vineyard guarding this Block. Tavo said see how it looks like a stag resting on the ground with a wide base and two separate trunks in the front that extend towards the sky. I completely agreed that look like a stag. It looked like a stag guarding my little 1.74 acre curvilinear plot of fascinating Chardonnay. We got out of the truck he walked down the rows between the trellises. The first thing that crossed my mind is the feel of the ground. Instead of hard, solid ground my feet were sinking; it was sand. There were also several old trees randomly mixed into the vineyard. This was very interesting. The trellis was bilateral cordon with a cracked cane technique: some of the canes were directed below the canopy towards the ground. Healthy, vibrant vines with golden grapes of Chardonnay. They were beautiful. Not one bit of mildew or raisoning. I did not see any problems at all: Strong and healthy, the vine rows ran in an East West direction. They were facing the sun and there was no evidence of any sunburn. Care and time had manicured these immaculate vines. These grapes were unique. I walked around the multi-levels and felt more and more impressed. I felt connected. This is where my Chardonnay was going to grow. Then and there are I told him that this would be the land I would work. This is where I wanted to be long term. It already had a very pruned and low yield which is exactly what I wanted. 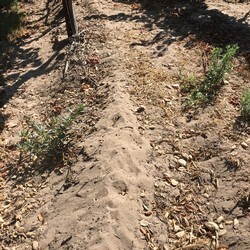 Later I was told that area before it became a vineyard was covered in rocks and dirt with nothing growing except for 1.74 acre flat where they grew a crop of flowers. It was the only use of the land in the beginning before the Vineyard was cleared and planted with grapes. This is the reason why I call this Block Flower & Stag. The first vintage will be 2016. Stay tuned for some amazing Chardonnay. 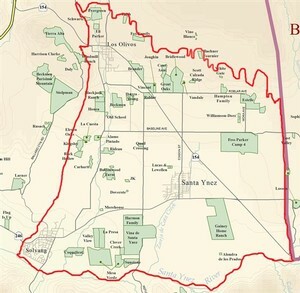 Location: Estelle is the most Northeast of the vineyards that make up the Los Olivos District. It sits in its own corner abutting the Happy Canyon AVA. 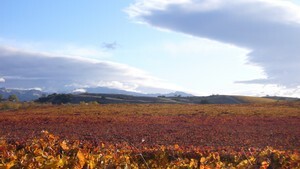 Grape Varieties: Albariño, Barbera, Cabernet Sauvignon, Grenache, Grenache Blanc, Grenache Noir, Loureiro, Merlot, Mouvedre, Nebbiolo, Sangiovese, Syrah, Tempranillo, Verdehlo and Viognier. Soil: Well-drained, fine, sandy loam with a clay subsoil. Fairly broad alluvial bench underlain by terrace deposits of Orcutt sand. Climate: Mediterranean with cool wet winters and warm dry summers. The juxtaposition to the Pacific Ocean provides cooling coastal winds and morning fog. 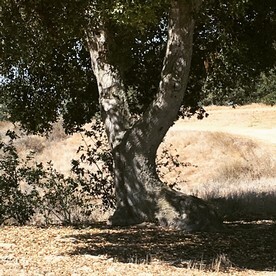 Los Olivos is warmer than its neighbor Ballard Canyon but more temperate that its eastern Happy Canyon. Topography: The front vineyard is relatively flat with a south-facing alluvial plain. The back (Block 8&9) has a moderately sloping terrain. 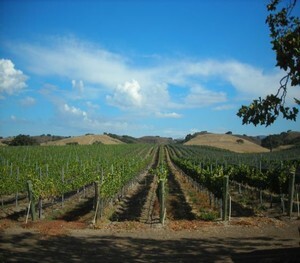 Seal Beach Winery has been working with Estelle Vineyard since 2009. The first vintage was a blend of several Blocks. Presently we are working with Cabernet Sauvignon in Blocks 8 (Clone 337), Block13 (Clone 341), Block 14 (Clone 101) and Block 16 (Clone 338). In 2016, we added Merlot Clone 181 in Block 12 and Sangiovese Clone 3 in Block 2A. The vineyard is meticulously cared for by John and Ivan Belfy. 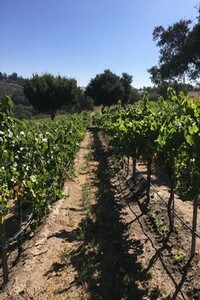 John planted Estelle and many of the vineyards within the Santa Ynez Valley. The perfect marrying of Scion Clone, Rootstock Clone (second number after the dash—110R), soil and climate is an art form that is mystifyingly difficult and defined by an infinite number of variables. The vineyards are immaculately farmed with old school trellising and overcrops but app loaded continuous satellite monitoring. 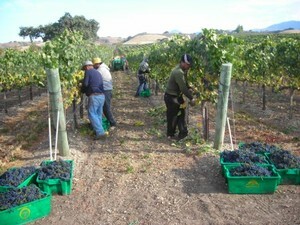 At harvest, the grapes are always beautiful and hardly require any sorting whatsoever. It is viticulture as described above that makes the winemaking so easy. Just don’t screw it up! Is the definition of Estelle Cabernet. Crush and De-stem, into the fermenters, inoculate, press and age in barrels. It is that simple. Merlot is blended into the Cabernet Clone Cuvee that we make. It is planned to have its own varietal bottling as well. The Sangiovese has been offered as a Growler wine but in the future we will be bottling this wine. The overall intensity, varietal expression and vinified complexity set the character of Estelle Wines. Having a leaner fruit style than neighboring Happy Canyon but an uniform soil type allows great balance and long term aging. 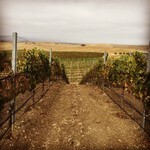 SBW has long term contracts with Estelle Vineyard and a commitment to the Cabernet Project. Estelle has been with us from the beginning and will be there as we evolve into future. Expect many new blends for the Growlers and Bottled Varietals with Estelle Grapes defining the high quality that we strive to achieve in every Vintage.